Business activities are only made possible by having a healthy global environment and sustainable social development. 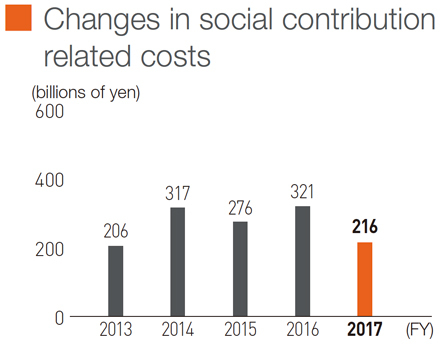 In order to place an emphasis on social contributions, the HCM Group created the “Hitachi Construction Machinery Group Social Contribution Policy” in FY2006. Under this policy, the HCM Group is deeply aware of the fact that we are part of society, and in addition to participating in the resolution of social issues through business activities we also undertake initiatives to achieve an even better society through social contribution activities. Our group solves problems in society through our business, and contributes to society as a good corporate citizen for a better society. Also, our group contributes to society by providing personal, material and financial supports, with the participation of our employees, making the most of our group features, with the understanding of our stakeholders. We do things for people, which cannot be done alone, by making the most of our group features. Our group performs activities to materialize a sustainable society where business coexists with the natural environment. Our group, which performs business throughout the world, goes along with the community. Hitachi Construction Machinery Australia (HCA) supports donations of medical equipment to pediatric hospitals in Australia. HCA supports the activities of the Humpty Dumpty Foundation (HDF) in Australia. The foundation was established as a charitable organization to help children in 1996. HDF is engaged in delivering medical equipment to pediatric hospitals in Australia. 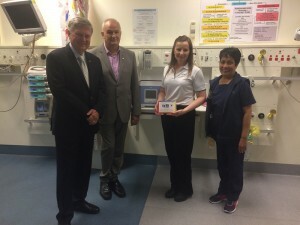 One the HDF’s fundraising activities is the Humpty’s Wish List which features life-saving medical equipment expressly needed by the over 250 hospitals and infant wards in Australia. The list provides donors with the opportunity to choose a piece of medical equipment for a hospital of their choice. Donors submit their request to the foundation and are matched with a hospital. HCA endorses this activity and each year donates medical equipment worth AU$100,000. HCA plans to continue to work with the Humpty Dumpty Foundation to carry out activities that put smiles on the faces of children in Australia. The municipal government of Heifei City in China’s Anhui Province has been implementing the Hefei City Project Hope since 1992 to support philanthropy that benefits youth. Many companies endorse this project and to date a number of different activities have been carried out. 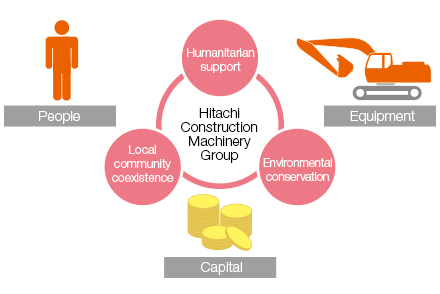 Since it was first established, Hitachi Construction Machinery (China) has been involved in activities that benefit society through this project. In particular, in the area of education, Hitachi Construction Machinery (China) has striven to create educational opportunities for children. These efforts include the construction of Hitachi Construction Machinery Songgang Xi Wang Elementary School in 2010 financed in part with an education fund donated to Hefei City, along with regular visits, the donation of educational supplies, and by providing hands-on learning programs. In August 2017, Hitachi Construction Machinery (China) was given the Hefei City Project Hope award by the City of Hefei for these contributions to the community. 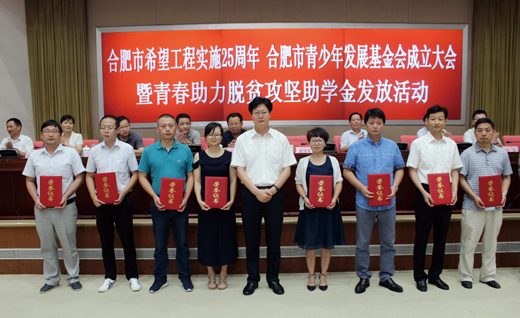 Hitachi Construction Machinery (China) will continue to support the Hefei City Project Hope and provide assistance to youth, who represent our future. The Horqin Desert located in the Inner Mongolia Autonomous Region is the largest desert in China. Until about 20 years ago, most of the population lived a semi-agriculture and semi-animal husbandry lifestyle in which they farmed corn for animal feed while raising cows or goats on pasture land. However, the effects of drought completely transformed the once grassland into desert, resulting in serious issues such as a decline in agriculture and livestock productivity and growing damages caused by desertification. 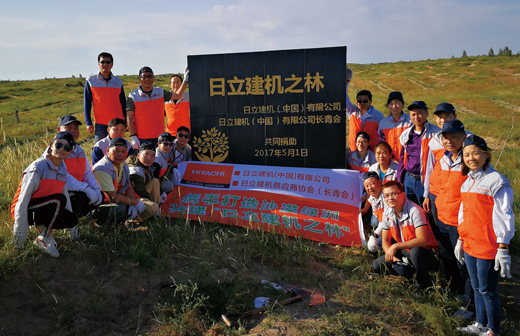 The HCM Group began greening activities in the Horqin Desert in 2004 after endorsing the mission of the Green Network, an NPO. The first 10-year plan was launched by Hitachi Construction Machinery (China) in 2004, and by the end of this plan in 2014 vegetation had been planted on some 100,000m2 of desert land. Later, the second 10-year plan began in 2015, with the goal of planting vegetation on 130,000m2 of land in a separate area of the Horqin Desert. Since the start of this plan, Hitachi Construction Machinery (China) has been planting vegetation together with dealers to meet this goal. Furthermore, Hitachi Construction Machinery (China) is promoting the restoration of vegetation on another 100,000m2 of land together with suppliers as the third 10-year plan. The restoration of forest and vegetation on a cumulative total of 330,000m2 of desert land will preserve biodiversity and lead to greater CO2 absorption and resource circulation. Over the many years of these activities we have built strong relationships with the local government and people. Local revitalization realized through these activities because of the involvement of local people in such work as fence building, planting and maintenance has also contributed to community development. Some wild green pheasants and fox can be seen again in the location where these activities first took place, indicating that biodiversity has been restored as well. The HCM Group will continue to promote greening activities in the Horqin Desert in order to resolve regional environmental issues and to balance improved quality of life with sustainability. Known as the country with the highest density of landmines in the world, Cambodia and its people still suffer from injuries and fatalities from landmine accidents even though its civil war is long over. The HCM Group has been donating to Good Earth Japan (GEJ), an NPO, since FY2007 to support the self-reliant living of local residents in Cambodia. GEJ is involved in promoting and improving farming technologies by providing agricultural training as well as infrastructure development, including roads and irrigation ponds, to improve the living environment. In addition, it also plays a role in advancing education in the country. 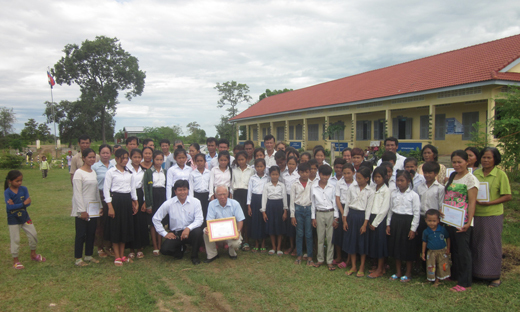 In June 2017, a dormitory for teachers was built next to the primary school of Prahop in Battambang Province with the financial support of GEJ. The primary school was constructed in 2010 but due to its poor traffic access for commuting, teachers had been using one of the classrooms as their office and dormitory. As such, for several years now GEJ has received requests to build a teachers’ dormitory. HCM cooperated with Hitachi Construction Machinery Tierra and Hitachi Construction Machinery Japan in donating a portion of proceeds from sales of mini-excavators to fund the construction project, making the plan come to fruition. The quality of education is expected to improve thanks to the new and improved work environment for the teachers. In FY2018, we will continue to support regional development in Cambodia through our support in agricultural development, highway maintenance, and school maintenance and management.